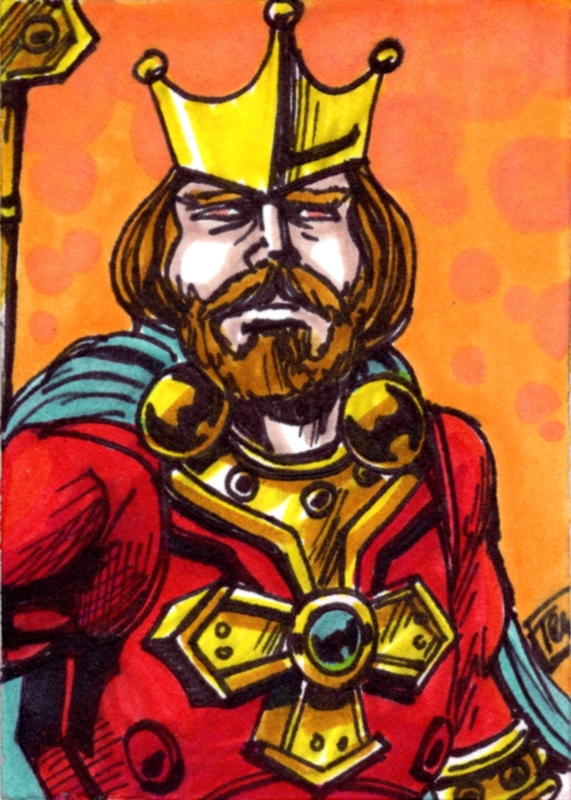 Taylor's Sweet Little Art and Nerd Site: Pin-up of the Day- King Randor! Pin-up of the Day- King Randor! Oh King Randor, are you the true ruler of the burger? Are you the Burger King? There is no relation between the two, but come on, someone was inspired a little from the other! King Randor is the father of Adam in the Masters of the Universe story. As a kid, I always wanted a King Randor action figure. Now that I am older, I still want one and the Classics version of him too. He has a really cool color scheme and great design elements. He looks a lot like the Burger King which is always a plus in my mind. He can rule my hunger and feed me delicious whoppers any day! You can also see this here on my deviantart gallery. I had a blast on the DELol show. I was there talking about Xenex the Bug Man, my custom toys, and Jeff and I's podcast, Talking Toys with Taylor and Jeff. Here's a link to the show I'm on (episode 42). If you haven't listened to the DELol show, you are truly missing out. Pin-up of the day- Namor!